Died 7th February 2019. Formerly of Edward Road, Whitehead. A Loving wife, mother and grandmother. Lilla's remains will be received into Our Lady of Lourdes Church, Whitehead on Sunday 10th February at 6.00pm for Requiem Mass on Monday 11th February at 10.00 am followed by burial in Prospect Cemetery. 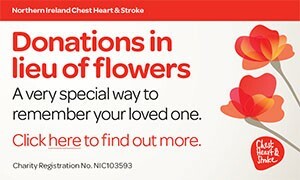 Family flowers only please, donations in lieu if desired made payable directly to N.I.C.H. & S. ,21 Dublin Road, Belfast, BT2 7HB. I am sorry to tell you that Lilla WATERMAN has passed away.